It is in the shadow of that question, that emerges frequently while teaching philosophy to university students, that “Dr. Sue” worked with Enable Training and Consulting, Inc. to produce an “App” for young people (Tinker Thinkers), based on her university-level critical thinking book Thinking Your Way to Freedom: A Guide to Owning Your Own Practical Reasoning (Temple 2009). The goal of the App is to enlighten youngsters, as young as elementary-school age, to understand that good thinking can be your best friend; it can save you from making poor decisions, it is necessary for being able to communicate well with others, and it can be like a magic cloak that can protect you from unreasoned mean attacks of others. This too, is the goal of the THINK FUN CAMPS, of which Dr. Sue is the director, i.e., to fire up kids to the power of thought. Dr. Sue has been intimately involved in all aspects of the creation of this camp and will continue to be “hands-on” for the duration to ensure that there is so much fun going on that the campers will barely notice that they are learning how to think in the process. Dr. Susan Gardner is a philosophy professor at Capilano University and the founding director of the Vancouver Institute of Philosophy for Children (VIP4C). For more details on her numerous publications seehttp://www.capilanou.ca/philosophy/Dr–Susan-Gardner/. 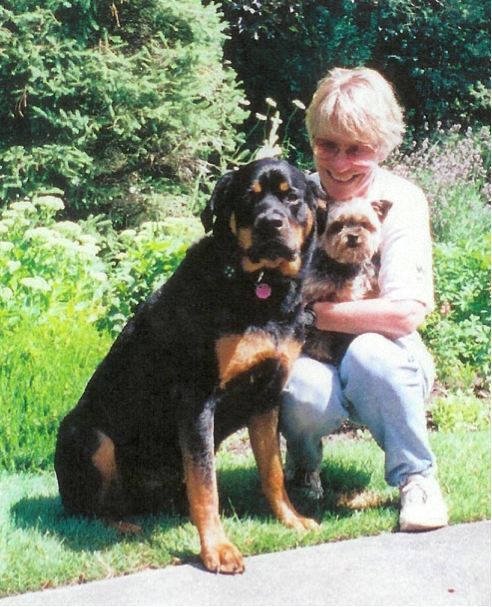 The photo below shows Dr. Sue with Diva and Bennie, the pooches in her critical thinking text who show students the importance of reasoning well.